Ok been reading the forum, evaluating my progress/notes, and have a few questions to reassure my self all is doing well. I read a post today talking about yeast and specifically SafAle US-05 temps. The range is ~54-77 degrees, but ideal is ~59-72 degrees F. I kept my primary fermentation at 72 degrees for 14 days and since transfer my secondary is in my closet at ~69-70 degrees. Most of what I have read here on the forum it appears most us s lower fermentation temp than I’m using. I’ll admit I never saw a bubble in my airlock on the primary, but I put that off to a poor seal on my bucket. 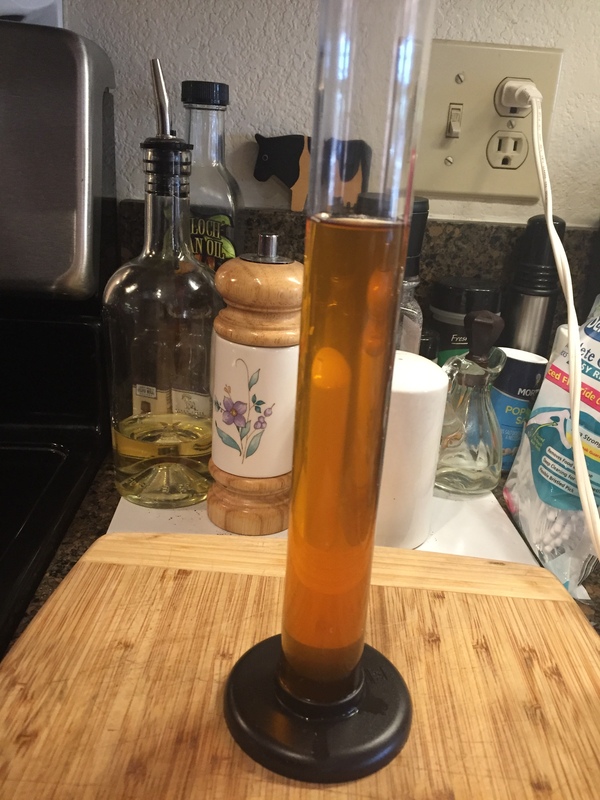 I went strictly off specific gravity readings and the 14 days in primary the recipe directions called for before transferring to my carboy. It was 1.010. Since then (3rd day) my carboy airlock is intermittently bubbling, but I assumed that was a result of kicking off some of the suspended yeast. There was a nice layer of ‘stuff’ on the bottom of my bucket along with a crusty ring which I watered down and poured on my tomatoes. All in all I think things are going well, but I’m curious to hear from you out there regarding temps, etc. or if I’m missing something let me know. I’m learning. Now, I do use a freez-menter... freezer with a controller.. Why? I knew you were goin to ask... No matter what... I can control the temp... Even Ales I ferment about 63* because I like them a bit cleaner...I start fermenting as I've stated, after it quiets down... maybe a burp every couple of minutes, I allow it to rise to ambient room temp... It will sit there... sometimes a couple of weeks.. to finish cleaning up... AND, its so simple to cold crash before I go to packaging... This just helps sediment to fall out of suspension... clearer looking brews.. I fermented at the higher end with Us05 alot when I started and it made good beer. I do it cooler now to kind of slow it down since I generally let it sit for 3 weeks anyway . Buckets don't seal well. You can pop up an edge of the lid and look in if you want to see how things are going. I'm not a big user of 05 but I believe I've heard guys say they get a peachy flavor when they ferment is at the lowest end of the range. I personally try to keep near the low end on all my fermentations to minimize the possibility of off flavors and a hot fermentation. Another isue with fermenting that warm, which @sneezles61 alluded to is it doesn't leave you much wiggle room to raise the temp for a D rest without applying heat to the fermenter. When your fermentation is winding down but yeast are still active you can raise the temperature 8 degrees above your warmest fermentation temperature to help it finish off clean with what's referred to as a diacetyl rest (D rest). If you're fermenting in the low to mid 60s then you can just let it go to room temp and generally be OK...Some brewers don't do a d rest but some of us swear by it. Look into swamp coolers for controlling your fermentation temperatures. Could be a life saver in your hot climate. So, I tried to hit the middle of the ideal temp range for the SafAle yeast. I had a thermometer measuring room temp and the bucket had one of those stick on temp gauges. My room temp was a steady 70F. I saw the bucket temp raise to 72F and sit there for the entire 14 days. I understand using a secondary is out favor, but I wanted to learn that process. I went with my closet and the lower temp (68-70F) for secondary based upon Miller’s recommendation in his book. Summer is on the way and we will be hitting triple digit temps. I’ll have to learn how to ferment at the higher temps (yeast?). I’ve read using a water bath and t-shirt to create an evaporative cooling affect. I’m going to start my second batch next week. I haven’t looked at the yeast temps for it. I guess I should do that now. You should consider using a srain of Kveik yeast. It's much more suitable to warmer fermentation temperatures and could save you a lot of hassle and expense. Here’s an article I found on kviek yeast. It can handle up to 104F on the high end. I’ll have to try it this summer. My room temp is around 78-80F when outdoors is 115F. This should work well for my needs. It’s all packed in that thread on Kviek. Well it’s day 20 of Fermentation. It’s been in the secondary for a week. The intermittent bubbles in the airlock are occurring once every other day. The beer looks very clear with a nice copper color and I can see a 1/8” of sediment in the bottom of the carboy. Nothing looks wrong. No odors or foul smells. I’m planning to take a gravity reading Thursday/Saturday and if it’s below my last reading of 1.010 start prepping for bottling. I’ve already cleaned my bottling bucket, bottles, and various items I’ll need for bottling. I looked into the D-rest and have found a lot of interesting opinions. It seems that for some it’s a must and others not so much. For now it’s full steam ahead. I’ll see how she tastes prior to bottling and use that as a gauge going forward. I wouldn't worry about a diacetyl rest with this ale. I've only encountered it once in an ale, a stout, and it went away in a week. Which was sad because I liked it. I have to agree based upon my limited understanding of how/when diacetyl is produced. Have to say I checked the gravity today and it was 1.006 My wife and I taste tested it and to my surprise she said it tasted like her favorite craft beer at a local brewery. I have to give it a high grade. It also had a great color. ~2 more weeks and I should be able to enjoy my first cold bottle. 1.006 is done. You bottle this weekend and test the first bottles next weekend. I'm impatient and drink them a few days in. I like experiencing the beer as an infant and as it matures.